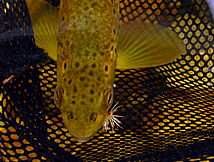 « Fly Fishing and the Pursuit of Enlightenment. Despite the fact that the fishing has been a little slow in the early season I suppose it is fair to say that it hasn’t been quite as slow as previous years when we couldn’t even fish. No doubt not only a plus for the anglers but equally for those small towns downstream of the fishing who haven’t seen half of their houses washed away this year. Fly anglers I am convinced are a rather perverse lot, in the end it isn’t the fish that you catch that make you return to a specific water but rather those that you see but don’t tempt. Much the same with the poor fishing, I have been out on the streams more in the past month than I have for a long while, again that perversity, had it been good I probably wouldn’t have been quite so motivated, the sense that “we have to crack it one day” has kept me going. With that in mind I set off yesterday , of course hence the late posting of this newsletter, for the Upper Witte. This is a stream which I used to fish regularly, in fact in my youth we would head up there two days on the same weekend, making the trip twice in quick succession although rarely to fish the same beat. Back then there were fish in the lower beats, I suspect they are now gone or the numbers further diminished. The place suffers dreadfully from the over abstraction of water from the summer flows, bringing the water levels lower down to a standstill and I am sure that can’t be good for the trout, or for that matter for any indigenous fishes that aren’t yet on the evolutionary brink of growing legs and lungs. I keep thinking that I should do an exploratory trip up the lower sections whilst the flows are still reasonable to find out for sure if there are any fish left down there. It is a pity, years back on my birthday I caught a 22” brownie below the hiking hut and it breaks my heart to think that, what at this time of year looks like excellent water, has been reduced to such a state by narcissistic self interest. Irrespective of past agreement it does seem to me to be insane that anyone, person or organization for that matter should be allowed to abstract the entire flow of a river and one hopes that in time sanity and the law will prevail and the water in the Witte will once again flow during the summer months. Mind you people all tell me that everything has an up side to it and if there is one here it is that there is fishing higher up, not only that but you need to be seriously motivated and relatively fit to access it. Hence there is less pressure on this water than almost any other beat under out control. My little jaunt on Thursday probably equated to a round trip on foot of some twenty odd kilometers, I think that is enough to stave off the advances of the average couch potato. I did however find fish, a few I spotted and duly spooked and several I picked up prospecting at longish range. The water up here is ridiculously clear despite its amber hue and the fish are equally not used to seeing anything much by way of movement so are particularly quick to take offense at any intrusion. Paradoxically at the same time I don’t think that they are particularly fussed about fly patterns and the like, they don’t see enough of them to form an opinion. Presentation Presentation, the fly didn't seem to be too important. It is a trip that I haven’t made in years, in fact I ventured further up the stream than ever previously and it was both challenging and fun despite the near crippling stomp homewards. These fish are as pretty as they always were; a particularly noticeable feature of the strain is a frequently bright red dotted adipose fin, such that for a second they look almost as though they were tagged. High up the pickings are thin and the water thinner so I doubt that there are many monsters up there, but there could be a few and I think that I shall have to make the trip again in the not too distant future, I just need a bit of time for my calves to recover. Still it was worth it, wonderful scenery, clear water and some genuine wild trout, not a lot of them but some. Working on the same basis that I measure the fuel consumption of my car you could say that working on the distance walked it averaged out at about fourty trout per hundred kilometers an entertaining if entirly useless statistic. So October is upon us, the first month of the season passed and that means that summer should be around the corner, more stable conditions and removal of the rain jacket from your back pack to make way for the sunblock. The Cape Piscatorial Society’s Bells Fly Fishing Festival takes place in October, I don’t know if it is fully subscribed as I type but if it isn’t then you definitely want to enquire about it if you are a novice angler on our waters. This festival has a special place in my heart because the one disadvantage of our catch and release regulations is that the fishing is a whole lot tougher than it used to be. I like that, I like the fact that it is more challenging, that there are more and bigger fish and that they demand greater expertise from the anglers. I also like the fact that if one finds and releases a 19” fish you know that it isn’t going to be whipped out next week by someone else and end up under a grill with some toasted almonds. I even like the fact that because of the catch and release issue most anglers will offer quality advice to newcomers, something a whole lot less likely to happen if they think that their neophyte protégée is going to be having a good ol’ fry up with the product of his learning. But it does make it hard if you are a beginner and the Bells Festival with its opportunity to fish with some of the best anglers in the province at least allows anglers to learn the ropes a bit faster than simply bashing about on their own without guidance. It is something quite special and if you are looking to improve your angling, or currently struggling on the streams then there cannot be a better investment than to attend this one. I shall be posting some information and images of my recent Witte River Trip on my next post on this blog so keep you eyes open for that. For now the sun is shining, the barometer seems to have settled somewhat from its roller coaster ride of the past month and things are looking up. 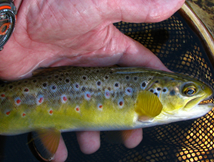 If you are out and about on the streams over the weekend, as always, “Be Careful Out There”. This entry was posted on October 1, 2010 at 2:46 pm and is filed under Cape Streams, CPS news, Fishing. You can follow any responses to this entry through the RSS 2.0 feed. You can leave a response, or trackback from your own site.